Kinesio Taping has become a standard treatment method among many physiotherapists and similar professions during the past few years. Originally Kinesio Taping was developed by Kenzo Kase in the 70’s when he found out that moving the skin affects the range of motion and pain. The method received attention in the Olympic Games in Soul 1988 and spread to Europe from North America in the late 90’s. With the development of taping techniques, Kinesio Taping is nowadays used in many areas of physiotherapy, including musculoskeletal problems, management of scar tissue, lymph oedema and pediatry. In sports circles, e.g. athletes like Tiger Woods, Carolina Klüft, David Beckham, Serena Williams and Lance Armstrong are users of Kinesio Taping. 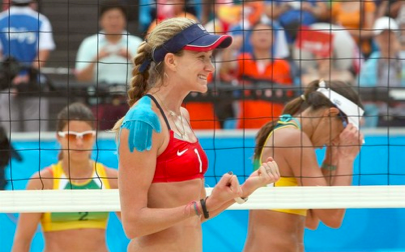 The most typical application of Kinesio Taping is to increase the painless range of motion and muscular power. The method can be used to support the body’s own healing process e.g. through the circulation, lymphatic system and neurophysiology. As for the joint mechanics, Kinesio Taping can be used to increase the joint’s range of motion, guide the joint to act functionally right and bring mechanical support to the joint by pulling the tape tight or applying more tape layers. Still, kinesio taping works primarily through the sensory system whereas the traditional sport tape has true mechanical effect too. The amount of Kinesio Tape used is smaller compared to traditional sports tape. The advantages of Kinesio Taping are a wide range of use, a good cost-effect ratio and it being fast and easy to apply. Effect mechanisms vary depending on the technique used. Kinesio Tape has elastic properties and the capacity to lengthen 30 – 40 % of its original length. By weight and thickness it equals to the skin. The material is 100 % cotton. Its airy structure makes it breathe. 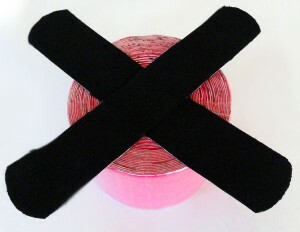 The tape glue is hypoallergic acryl and feels comfortable in daily use. Kinesio Tape will stay on the skin from a few days to over a week depending on the application, the skin type, the taping location and the quality of the tape. Kinesio Tape also allows showering and swimming. Kinesio Tapes come in different colours, but they are similar as for the feature. This means that kinesio taping colour can be picked with preference. The original tape has been copied and nowadays there are many different brands available. Some of the tape brands are poor in quality and may irritate the skin and not stick well on the skin, but most of them have a good quality. Typically, one 5m tape roll is enough for several musculoskeletal tapings. For lymph taping, more tape is usually needed, depending on the case. Some of the tapes are cut ready to different shapes (pre cut). 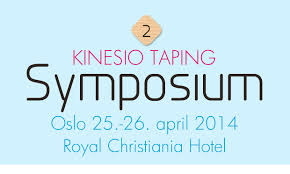 The use of Kinesio Taping is based on the patient’s medical history, observation and especially clinical tests. SLR, Patric, SLUMP and shoulder apprehension test are familiar tests in physiotherapy and they are helpful in Kinesio Taping too. The tests are used to find out if skin movements have an effect on pain, muscle force or joint range of motion. The goal is to find the optimal position of the skin/fascia and use kinesio tape to maintain it. The taping is less effective if the optimal position is not found. Otherwise the effect is noted right away. Sometimes the taped area is located further away from the problem zone. The tone of an overactive or hypotonic muscle can be normalized through the neurophysiological system. According to the theory, the tone can also be affected depending on the direction and tightness of the taping. So the function of fascia in muscle contraction can be affected. The tape doesn’t complicate activities of daily living or use of other treatment methods. Kinesio Taping is usually included together with other physiotherapeutic treatments. However, sometimes the patient has tried other treatments (traditional physiotherapy, cortisone and painkillers) but noticed that the kinesio taping had been the only method which had worked well. According to my own experience it’s difficult to predict the effect of Kinesio Taping in advance based on a diagnosis. After e.g. a pulled muscle or an Achilles tendon injury the Kinesio Taping may result in a remarkable aid but sometimes the benefit may be poor even though the diagnosis is the same. Also, taping experience and education have influence on the results. Kinesio Taping can be applied using different techniques, depending on the goal. 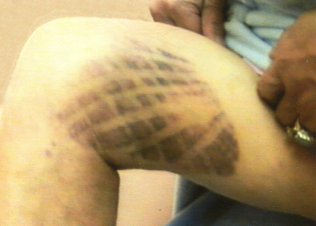 For example in an acute soft tissue injury, tape is applied to reduce the swelling through the lymph technique. Later, the muscle activation technique can be used and that way affect the position of the skin/fascia through the different correction techniques, if the tests show that a different skin/fascia position reduces pain, increases motion or muscular power. The basic technique of Kinesio Taping is muscle correction, where the muscle is set to lengthened position and the Kinesio Tape is applied on the skin without stretch or with light stretch. Restoring the joint position causes convolutions which also lifts the skin upwards. This increases the local circulation and lymph flow between the skin and the muscle and reduces stress on the pain receptors. In different correction techniques, (fascia correction, mechanical correction) the skin/fascia can be guided to a desirable direction or kept there. The functional technique is used to position the joint functionally right. In taping, the so called space technique can be used as well as the tendon or ligament technique, where the tape is stretched a lot (80 – 100 %) to bring also some mechanical support. In the lymph taping technique, the tape is split in thinner strips and the base is applied on the lymph nodules, where the fluid is wanted to travel to. During daily activities, the motion also moves the tape/skin which has similar features with manual lymph drainage. In addition to five other tasks, the skin also works as a sensory organ. One of the tasks as a sensory organ is to bring different kind of information to the central nervous system, which also affects pain and muscle activation. Proprioceptic information from a muscle is brought by the muscle spindles and the Golgi organ. A tension equal to one gram and a stretch of a micrometer is enough for the muscle spindle to activate. The fascia is richly innervated with free nerve endings and mechanoreceptors (particularly Pacini and Ruffini) which bring information to central nervous system e.g. about pain and position. Different receptors have different locations and tasks. For example Ruffini endings are sensitive to lateral stretch and when activated, they lower the activity of sympathetic nervous system e.g. increasing muscle relaxation. For example in the Tibial nerve there are three times more sensory nerves than motor nerves which cause muscle contraction. The number of Merkel cells in the body approximately 60 million. Fascia is a structure made of e.g. collagen and extracellular matrix. It surrounds each bone, nerve, muscle and its fibres etc. Fascia is closely related to the skin by attaching it to the deeper layers. The role of fascia is to separate different structures from one another to protect them. Fascia also has a role as a force transmitter in muscular activity, an attachment place for anatomical structures and a structure taking part in communication with sensory receptors. Deep fascia also contains myofibroblasts, which give the fascia the ability to contract. Poor posture habits, repetitive motion, injuries, inflammations etc. may change the structure of fascia, in which case collagen production increases, filaments become shorter and the distance between filaments decreases. This will lead to an increase in cross links, randomized orientations, drying and hardening of fascia and finally a decreased range of motion of a joint. Stretching the fascia to a certain direction may open the filaments, decreasing the stimulation of pain receptors. Because the fascia is sort of like a continuum surrounding the body, a hypomobility in one place also affects further. The superficial fascia is often described as a three dimensional net or a cloth which should freely conform the motion of the joints. A shrunken or adhered fascia increases the pressure which stimulates pain receptors, leading to dysfunctions in muscle function (i.e. decreased muscular force). Even though the structure of the fascia is healthy, a nearby located swelling can stimulate the receptors to cause pain and dysfunction of the muscle. One of the tasks of the lymphatic system is to remove the extra fluid from the interstitial space. Without the lymphatic system a human could stay alive for only 48 hours. By knowing the structure and function of the lymph vessels, it’s easier to understand the role of kinesio taping as a controller of swelling. Lymph capillary (0,01 – 0,03 mm.) which consists of endothelial cells is the initial head of the lymphatic veins where the tissue fluids move first. 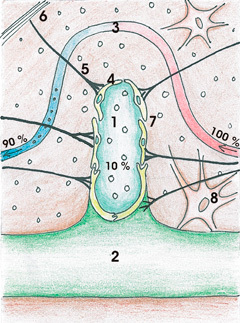 Prelymphatic channels are channels made of connective tissue, which guide tissue fluids to go towards the lymph capillary between the opened endothelial cells. The anchor cells attach to the endothelial cells and surrounding connective tissue, thus stabilizing the structure and taking part in the opening of the endothelial cells. Multiple lymph capillaries are brought together to form a thicker vein (pre collector) in which the valves between 2 -3 mm prevent reflux. Again, multiple pre collectors enter a thicker vein, a collector, which has both valves and heart like smooth muscles (lymphangions). They pump lymph fluids forward towards the lymph nodule 6 – 12 times a minute at rest. The rate can be sped up by a factor of 10. Lymphatic capillaries are found almost everywhere. 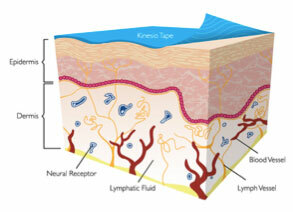 Most of the lymphatic veins are located between the skin and the muscle. For example the dermis is rich in lymph vessels and thus easily affected by Kinesio Taping. The fluctuation of pressure caused by kinesio taping opens the endothelial cells and aids tissue fluids to enter the lymph capillary. The anchor filaments and the connective tissue assist in this. This is probably the most important mode of action of Kinesio Taping, but the reduction of swelling is influenced by many other things too. In motion, the tape slightly spreads the fluids around so that more lymph capillaries take part in the removal of fluids. Most likely the tape is capable of opening obstructions in the veins so that the fluids can travel freely. Motion may activate the lymphangions of the collectors through the stretch reflexes. Kinesio Taping affects the tension of the fascia and muscles and thus could promote the work of lymphangions. A pain relief often leads to an increase in muscle work, which also supports lymphatic flow. In theory the pain relief resulted e.g. from Kinesio Taping, reduces the spasm of lymphangion and thus increases the flow of lymphatic fluids in the collector. If a joint dysfunction is corrected, the irritated tissue will often calm down and the formation of excessive swelling is cut down. Finally the healthy lymphatic system will remove the swelling caused by inflammation. Mechanical insufficiency of lymphatic veins will result in protein rich swelling (lymphoedema), which is often treated by a compression bandage. Kinesio Taping doesn’t replace compression. Still, Kinesio Taping is used in the body, where compression is not used or in situations where the compression is not meaningful (travelling, work, hot weather, minor swelling etc.). Also combinations of Kinesio Taping and compression are used. Diabetes, absence of sensation, renal failure, severe or untreated heart failure, acute asthma, high blood pressure, swelling of internal organs, swelling conduction to the other side of watershed if the side is already swollen or on the skin which is confronted with sustained pressure (lying, sitting). The tape glue is activated by heat (friction) and is adhered well after 20 – 30 min. The tape may stick better in a warm area, which requires more caution in removal. 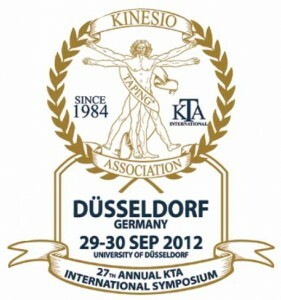 By the year 2012 over 200 studies (300 publications) have been made about Kinesio Taping. Approximately half of them have been translated into English. More support from high-quality studies is needed in order to indicate Kinesio Taping as a scientifically effective method. Clinical therapeutic applications of the kinesio taping method. — Kase, K. ym. 2003. Medical Taping — Pijnappel, H. 2006.